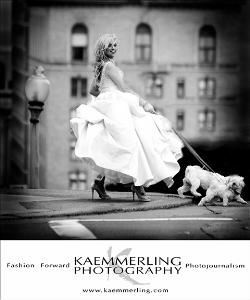 All I can say I John Kaemmerling is an AMAZING photographer! The engagement photos he took of our son Zachary and his beautiful bride to be Elizabeth are so beautiful. He has a natural talent for taking the "moment" shot, and capturing the feeling and love of that moment and day. He took photos of them with a vintage truck that were so cool. Not only fantastic still shots but my favorites are the shots of movement, showing the energy and action of loving. One in particular of Zachie, kissing Ellie or should I say biting Ellie on the neck is so funny and SO HIM! Our loving " Zach-attack"! ha ha. More than that, John really has the ability to bring out the best in the person he is shooting. The kids look like models, we all said - WOW! we've never seen them look SO GOOD!! ha ha A photographer really has to care, to make someone look good. You see it and feel it. I could not be happier that we chose John for the kids wedding photography. He is doing everything he said he would, unlike other venders, there are no games here, what John said he would do has come through 100% no extras, he is the best wedding decision we have made by far. We are so blessed that he is working with us!